Although we love to build, designing new spaces and consulting on interesting construction or architectural challenges is a big part of what we do at Cubist—even if we are ultimately not the builder. Usually that work is for a client, sometimes it’s just because we have an idea we want to see. A lot of our client work is confidential, but here are a handful of concepts we’ve created that we can share. Because we are a custom design/build shop, these are not models to choose from—we design each project unique for that client’s needs—but rather just some inspiration around what’s possible. do you Have a unique design/build/architecture challenge we can help with? This is a design we’ve been playing with that we call the Cubist Cabin. At 12’ wide x 20’ long, it’s an experiment in creating a simple, cost-effective building that doesn’t need to move often. The front of the Cabin features a 2’ overhang to create a covered entry, a perfect place to sit and take off your boots, or just watch the world. Wood stoves, kitchenettes and hideaway beds would all be options in the Cabin interior, as well as shiplap or plywood walls. This design is a weekend getaway with a covered entry on the short side and an expansive deck out front. A 10-foot folding wall brings the outside in. The same weekend retreat with a white-washed cypress exterior siding. Inside a large sofa, expandable coffee table and wood stove make a cozy entertaining space. The Murphy bed converts to a desk or eating counter during the day. This client didn’t want any kitchen facilities—just a custom hutch that could hold a cooler and some snacks. A full bathroom is behind the wall. We love the idea of elevated structures—even getting 10 feet off the ground changes the whole experience. This “Treehouse” design features glass on all sides and a raised deck. 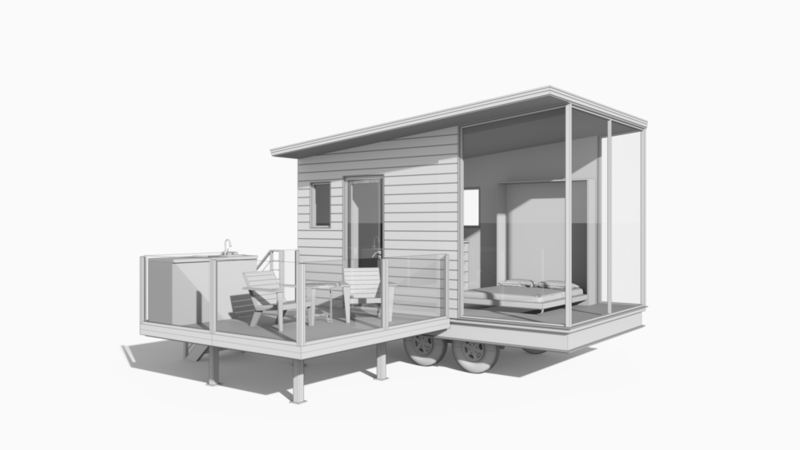 This design brief called for a small (16’x10’) cabin that could sit on the bank of a river and allow unobstructed views of the water. So we added a glass end cap that provides views up and down the river, and put the deck on the side of the unit. An alternate option for the riverfront unit, this would elevate and even cantilever over the creek. 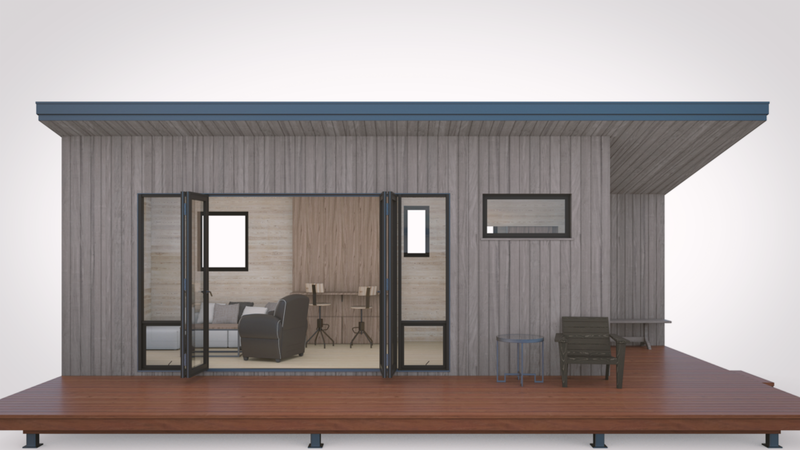 This design is for a 400 sq ft weekend getaway in which we’ve put two pre-fab boxes together to create a larger open interior space.